The nature-based playground has been created to follow national best practices in quality Early Childhood Education. 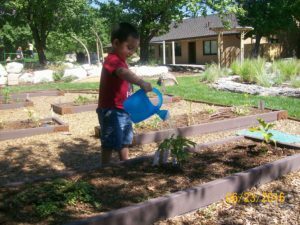 This outdoor environment allows children to explore the world around them in meaningful and engaging ways. 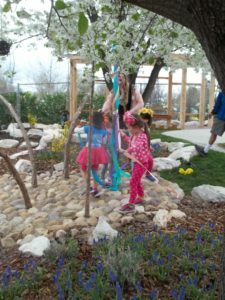 The goal is to have an outdoor classroom, not just a typical playground. 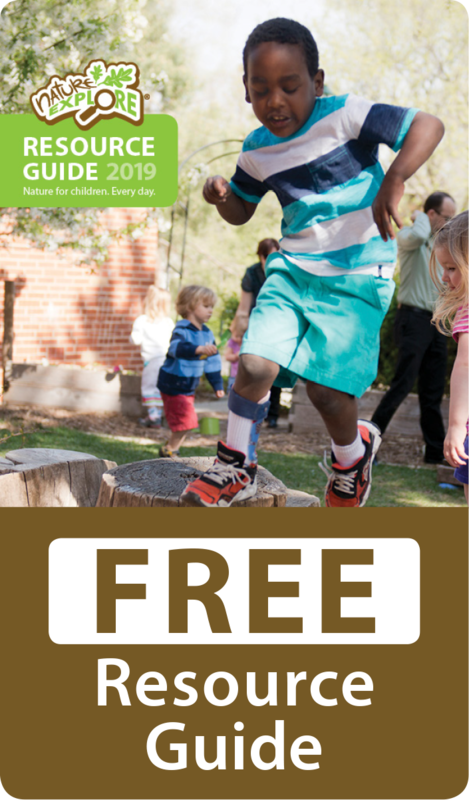 This environment offers places to climb, crawl, build, explore, hide, experiment with water, dig, garden, increase curiosity and create personal connections that instill an appreciation of the natural world. Children are able to develop skills in all areas of development through the exploration of learning centers. 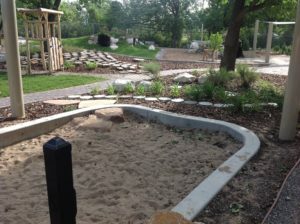 Our playground has many unique features that enable this to be a premier location for children to explore nature. A secret garden with only one, child size entrance with a beautiful lace-leaf maple is a favorite spot for children to hide. 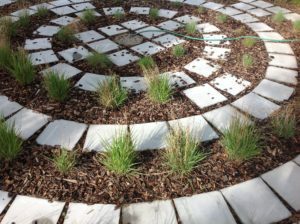 The labyrinth allows children to experiment with directional awareness and identification of patterns, through its calming maze paths. The garden boxes are child sized to enable them to use tools to plant, grow and care for plant life. Children are able to use observational skills as they document growth, and learn about nutrition as they grow their own vegetables. The water area has a child size water pump as well as a splash pad. Water flows along brick pathways for children to play in streams and a shallow pool of water below. Children are able to observe forces of nature, gravity, water flow, evaporation as well as cause and effect. Large crawl tunnels allow children to explore small spaces and provide a sense of wonder. The climbing area creates a safe area to challenge large motor skills and provide risk within boundaries. The geodesic dome is an inviting area to gather children and enjoy the architectural beauty above. Art exploration helps children to notice the details in nature as the discover line, color, shape and texture through the elements. Large and small building resources permit children to express themselves through construction materials and learn balance and physics concepts. Musical instruments offer children an avenue explore sound, rhythm and beat. 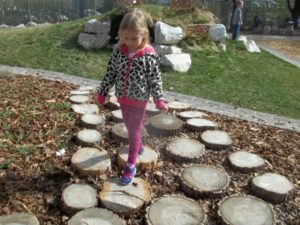 A variety of surfaces throughout the playground allow children to master gross motor skills as they navigate small pea gravel, medium size stones, large boulders, tree cookies and bark.